Once you become a devotee of the Italian formal tradition, and begin to wear a lot more browns in your outfit, it’s easy to go overboard. If shoes are usually brown and leather accessories always a shade of brown, a brown tie, jacket or trouser can become a dirge. This is of course more of an issue with sports jackets than suits: with a nice grey pick-and-pick suit, the browns and tans all work well as accents. It is the brown windowpane-check jacket that is dangerous, or the tan linen. I will write separately about the alternative colours for ties and handkerchiefs that work well with brown (think forest green and wine red). But I thought these pictures, taken at Cesare Attolini in Naples earlier in the year, show some interesting ways to wear shades of brown in accessories. The combination at top highlights how cream works as an alternative to brown. It is soft enough to do little but establish background to the tie and any other brown accessories. 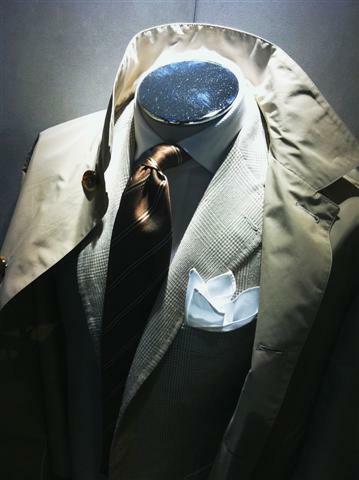 Even in both the jacket and raincoat, you can imagine this working with dark brown lace-ups and a tan briefcase. The contrast created by the pop of the white handkerchief helps, of course. The second combination, above, shows how effective a burn orange can be – it doesn’t feel out of place with brown, despite being so close in tone. 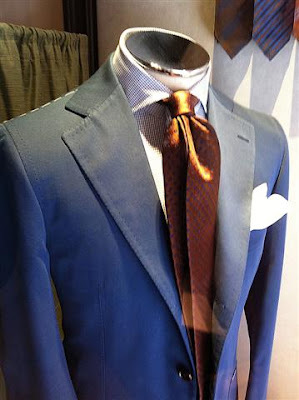 Although the blue cotton suit is easy to work with, the same brown accessories mentioned earlier would harmonise with the tie rather than echo it. I was very impressed with the quality of workmanship on the Attolini jackets, which have beautiful buttonholes and a hand-padded chest canvas. 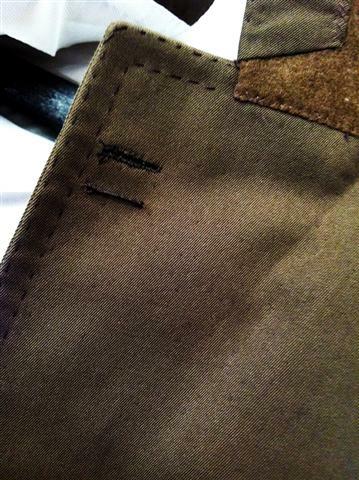 You can see the hand padding on the lapels below, betrayed by the prick stitches coming through. Apologies for the quality of the pictures – they were taken through a window with an iPhone. You can follow the discussion on Wearing brown accessories, at Cesare Attolini by entering your email address in the box below. You will then receive an email every time a new comment is added. These will also contain a link to a page where you can stop the alerts, and remove all of your related data from the site. Are these pictures taken from the shop at via dei mille? Do they do bespoke there or only m-t-m? Yes, and yes they do. Does the first photograph some kind of outdoor-pursuits anorak-type jacket over a normal sports jacket and tie, or is the garment a creaom summer raincoat? PLEASE, it should be the latter! What’s your view on this brand today? Worth the price?